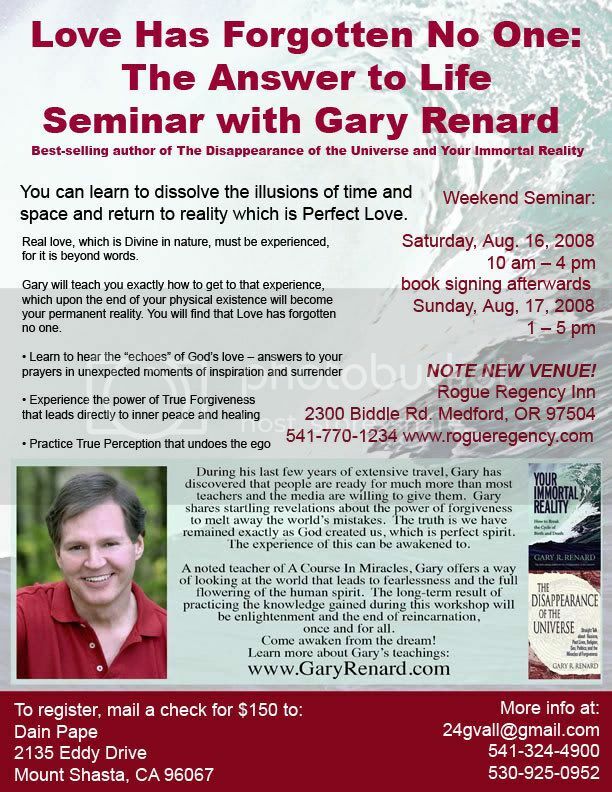 Best selling author of The Disappearance of the Universe and Your Immortal Reality, Gary Renard, will be appearing for a two-day intensive workshop at the Rogue Regency Inn in Medford, on August 16th & 17th. The workshop goes from 10 – 4 on the 16th, immediately followed by a book signing. The workshop resumes on the 17th, from 1 – 5. Tickets are $150.00. Email 24gvall@gmail.com or call 541-324-4900 for info. Of the many books I’ve read on spirituality over the last thirteen years, nothing has explained the truth about God and our existence, and why we appear to be here, any clearer to me than Gary’s books. His books address heavy subject matter, while cutting to the chase in no uncertain terms, and doing so in a very entertaining and humorous fashion. I highly recommend them, though they are not intended for the squeamish nor the faint of heart, as the material is not sugarcoated. I am a former 'Masshole', born and raised on the south coast of Massachusetts, in the city of New Bedford. In the summer of 2004, I took a 'leap of faith', leaving my cushy job and comfortable life behind for the 'unknown' when spirit called me out to Mount Shasta, CA. One year later, I moved here to Ashland, OR, a place that feels very much like home to me; a place where I can be this vegan eating, tie-dye shirt wearing, skinny white guy, with my long hair and spiritual awareness in tow, and be considered almost normal! Spirituality is a very important part of my life, though I do not subscribe to any type of organized religion. However, my childhood did include nine years of catholic school, ouch! Anyway, my spiritual path is A Course in Miracles as described in Gary Renard's books. It's a rather simple path really, yet not an easy one. Faith and gratitude, along with a whacked sense of humor, and a heavy dose of rock n' roll, keeps me sane through it all - otherwise, I'd be jonesin'! 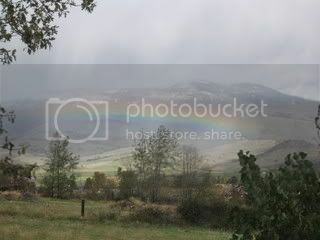 My intention in this currnet incarnation is to keep practicing living at the level of cause rather than effect, and to become more spiritually aware each and every day, while helping others to do the same along the way, as we all create a new paradigm of humaneness on this planet, which we sorely need. Oh, and my other objective is to win a new jeep on The Price is Right, giddy up! Employment Currently, I work in the HR Pension Benefits department at Harry & David in Medford. Formerly, I did investigative work for Bank of America in Boston, MA and Providence, RI. If you haven't had enough of my self-indulgence, you can visit me at: www.myspace.com/mikeymike1974 I'm also on Facebook too!